Everest Journal - Part 1 — NORTH BLOG. In this three part blog series l will be chatting about my expedition to Base Camp Everest along with my personal experience & reviewing all the wonderful gear that has been supplied by The North Face In collaboration with TISO (Scotland’s oldest & leading outdoor specialist) my main sponsor & supporter. 7th May 2016 - Scotland – Nepal. The trip started a few days before my actual departure date 7th May. Myself, blog partner Jawn & Chris decided to make a quick trip up North towards the Isle of Skye so we could do some last minute checks of our gear from Tiso (www.tiso.com) that we would be taking to Nepal. It was a windy, rainy but very successful trip in Skye which was a good get away before leaving for Nepal. Jawn unfortunately had to depart after Skye as he wasn’t going to make this trip due to the awesome recent birth of his baby boy Oliver. 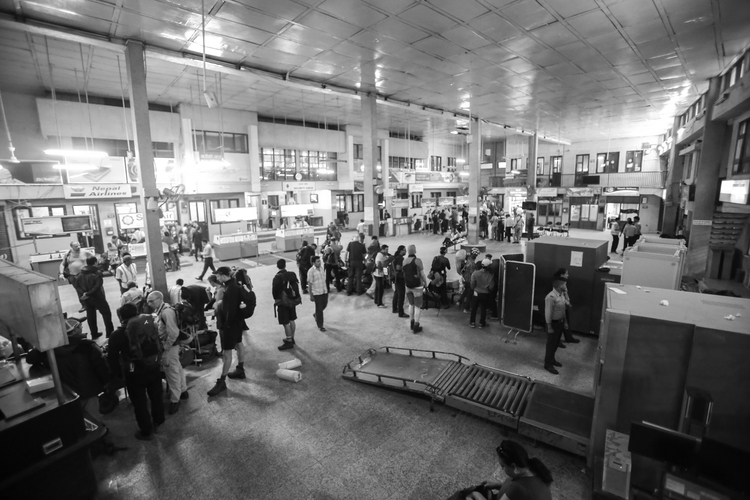 It was the day before our flight, nerves were kicking in as it was all starting to catch up with me that l was about to fly to Nepal then hike to Base Camp Everest. The realisation of flying pretty much half way around the world to do some hiking in one of the most organic, purest, beautiful landscapes on the planet really was making me feel on edge in the most positive way possible. This moment for me was going to change the way l live my life in the future, l knew this was going to bring me the goals l ultimately want, l was having incredible chills about all of what was going to happen, l hadn’t even hit the mountains & l was getting chills of euphoria. 8th May - Arriving in Kathmandu. I can instantly tell the poverty of the country and what damages the earthquake has done previously to the land, there is still many buildings that have been left unattended that collapsed. Such a shame that this has happened to a beautiful country but at the same time you see so many happy faces regardless of how much they don’t have to their name. What an inspiring buzz & I’m just getting to the hotel! As we arrive at the Radisson, lm ready to get things moving. Chris & myself are feeling ecstatic with excitement, the travels have already done so much for us and we haven’t even hit the mountains yet. As we enter the hotel they greet us with a nice freshly squeezed lychee juice, which was delicious, then Randeep announces we will have a group meeting in an hour to go over our itinerary in full detail along with any personal questions. Instantly l head straight up to the hotel room, shower then get some comfortable clothing on so I’m not sweating constantly in this heat. The hour rolls by after exploring the hotel, we meet in the lobby then head to a separate building part of the Radisson where we have our meeting with any drink that we want complimentary of the hotel. From the moment we landed, got to the hotel & have now got comfortable seating in this room where we are currently having this meeting, l have instantly clicked with two gents who will be trekking with us, Mark & Ed two Englishmen, which I can tell are going to make the trek that much more enjoyable with some great banter which l was definitely not wrong about. 9th May - Being a tourist in Kathmandu. Jetlag, hung-over, feeling very rough. Probably wasn’t smart to booze hard the first night in Nepal especially being a lightweight. Today was going to be a battle especially when we had a day of exploring Kathmandu that Randeep had organised for us. Breakfast 8am, and then we start exploring the city at 9am. Our first stop was Pashupatinath temple, l had zero idea of what l was about to encounter, the walk towards the temple was an experience within itself seeing monkeys just roam freely around the ground. Being from Scotland its not something that happens regularly unless you go to the zoo everyday, as l got closer to the temple l could smell regular smoke then l started to smell a funny rotten smell as if something that had gone off was burning. I continue walking throughout the temple grounds, our guide points out to us the burning of bodies for religious reasons, l’m in shock & thinking “WHAT, is this real, am l actually witnessing the burning of a human body?” So many questions ran through my head but it was true, the burning is completely acceptable & instead of the western way of cremating the bodies privately they do them openly. This for me was something l never expected to witness in my lifetime. l am forever grateful that l witnessed such a sacred religious way of being. It’s truly an amazing feeling being able to be in an environment having an understanding of how much more people are open with there ways of life. After my eye opener of a morning at Pashupatinath Temple it was onto the next sacred place Boudhanath Stupa. Boudhanath Stupa is the largest Stupa in Nepal and the holiest Tibetan Buddhist Temple outside Tibet, it is the centre of all Tibetan Culture in Kathmandu & extremely infinite in Buddhist symbolism. This for me was a very calming experience you could sense the energy around the whole area, such beauty in the design of the Stupa. Rise & Shine, 4am wake up call, breakfast, depart hotel 5am for 6.30am flight from Kathmandu Airport to Lukla Airport set in Khumba, Solukhumbu District, where we will start our first days trek completing part of our 62 Kilometers/38 miles towards Base Camp Everest. The flight from Kathmandu to Lukla is only just a short 30/40minute flight but the fear is hovering above me as l am well aware how sketchy this airport is. 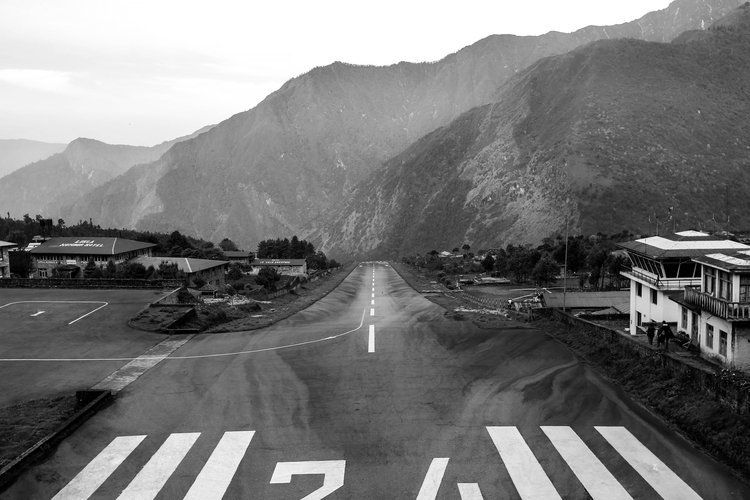 Lukla is ranked in the top 10 most dangerous airports in the world with a 1,729-foot long runway and an elevation of 9,500 feet, bare in mind the shortest runway at London City Airport is 4,900 feet so you can really imagine how small the runway must be at Lukla. “YAY!” We landed! “BRAVO!” Everyone is cheering/clapping, such a perfect landing, smiles everywhere! 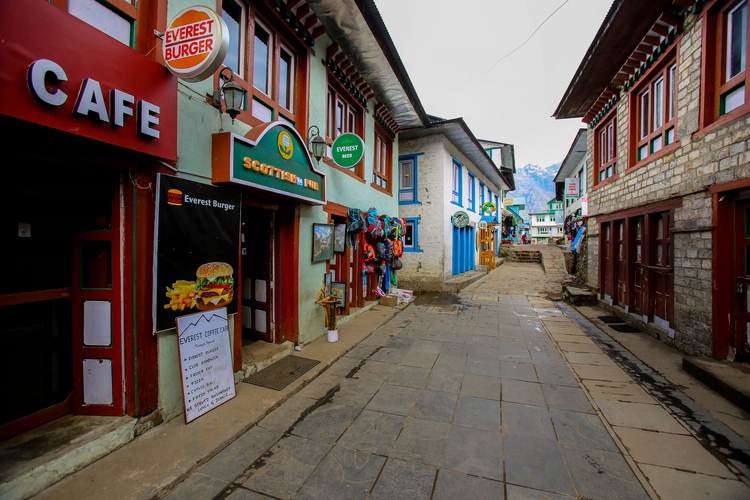 Off the plane we get, we drop our luggage off at a lodge in Lukla as we have about an hour to explore the small town while our guide Randeep sorts our hiking permits out. We were craving a coffee which lead us into a small local café that made us a great cup while we walked around the streets in this small town. The energy here is real, people are all smiling, children are running up to us wanting to play, bare in mind its only 7.45am, already the town is very much awake which l quickly learned that all towns in the Himalayas start very early around 5am then everything winds down about 7/8pm. Our hour goes by very quickly so we head back to the lodge that we initially dropped our bags off where Randeep is waiting. Randeep tells us we have a small 2 hour trek to Ghat Camp which will be a slow & steady walk so we can find our bearings & most importantly let our bodies adjust to the altitude. The trek to Ghat Camp was mostly downhill, rocky terrain & surprisingly quite similar to Scottish terrain except the sun was shining. We get to Ghat camp around 12pm, the weather is lovely so myself & Chris go for a wander around the area, chatting with locals plus seeing Sherpa after Sherpa carrying crazy loads of materials from doors, glass panels, food, beer, really anything you can imagine that helps them live daily & provide trekkers with comfort. If you’re not sure exactly what a Sherpa is... Sherpa is the name for someone who is a mountain guide or porter working in the Himalayas around Mount Everest from Nepal or Central Asia, they are naturally physically stronger to handle the extreme conditions in the Himalayas. Especially the altitudes while carrying tremendous amounts of weight in comparison with the average human being that will produce a high red blood cell count at higher altitudes & Sherpa’s which produce less red blood cells giving them this advantage over us on average. After having a wander with Chris trying to take everything in on my first day, we decide to head back to Ghat Camp where we can chill, get a good nights rest for the next days trek to Monjo Camp. 11th May - Monjo Camp. After a restless night, not getting much sleep in Ghat Camp waking up continuously to go to the toilet. Probably wasn’t smart to drink a lot of water before l went to bed but l wanted to make sure my body was well hydrated so there is less chance of getting altitude sickness. (Altitude sickness is caused when ascending high altitude which is more likely to happen if you ascend too fast, normally at a gradual pace your body adapts but in some cases your body still struggles with problems such as Headaches, Nausea, Vomiting, dizziness, tiredness, loss of appetite, upset stomach, feeling unsteady & a short of breathe). From landing in Kathmandu 1,400m then making my way into the Himalayas where l will be climbing Everest Base Camp 5,360m & Kala Pattar 5,545m the chances of feeling altitude sickness are high as you can feel the sickness as low as 2,500m. l really wanted to make sure l was doing everything l could to prevent this because it’s something that happens to even the fittest people. Its about 5.30am, l’m fully awake & feeling very well hydrated, the birds are singing, cows are mooing, dogs are barking. l think it’s probably better l get up as our wakeup call is 6am. As 6am rolls round, our Sherpa’s come round each tent serving us a nice warm cup of black tea. 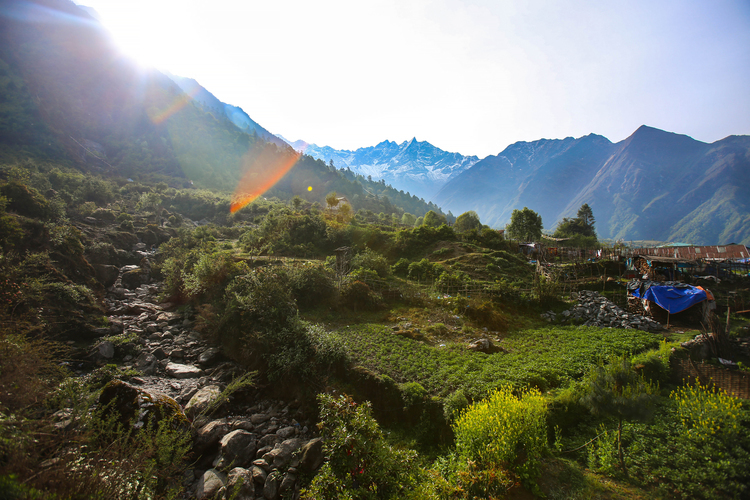 Black tea is very common here throughout Nepal & something that l have grown fond of plus nothing is more enjoyable sipping on something warm while the sun starts to pop through the clouds and before our day of trekking in these gorgeous Himalayan mountains starts. After enjoying my black tea, its time for “washy washy,” as the Sherpa’s & Randeep like to call it. We are given a small metal bowl, about the same size as a dog’s drinking water bowl so we can wash ourselves. (Nepalese cultures are very conservative in their attitudes with clothing which means men should always wear a shirt in public, long trousers & shorts in certain areas. Woman are accepted to wear long skirts that go below the knees, a Sari & also shoulders, chest areas must be covered at all times). While washing myself this is constantly going through my head, l want to make sure l keep the respect within my group of people especially with the Sherpa’s, locals & my guide Randeep. Bare this in mind there is not much water & it’s not exactly the easiest trying to wash all your body while keeping somewhat hidden, a quick rinse of the face & body parts, just enough to feel fresh for our tasty breakfast of porridge & a hard boiled egg with more tea. After breakfast we then depart for our hike to MONJO CAMP 2,850m. 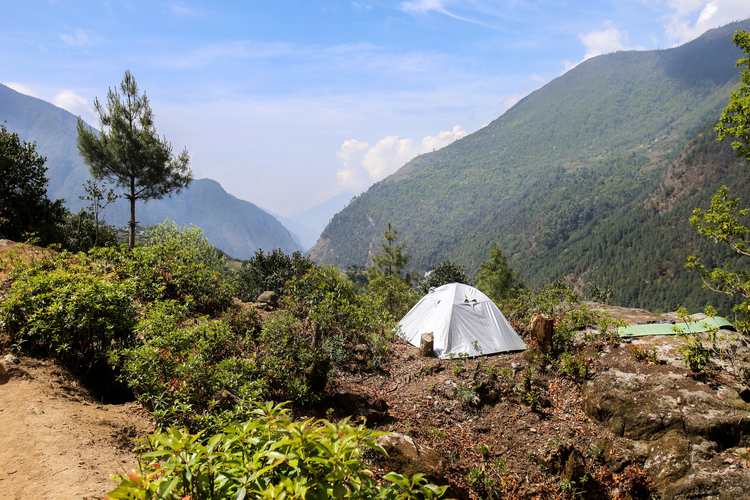 The trek to Monjo Camp is expected to be about 3 or 4 hours at a slow steady pace. Which seemed not bad at all especially with the weather being on our side. l wanted to push myself going at a good steady pace so l could give myself a harder challenge. Today felt like the first real day of trekking for me, l was extremely excited not knowing what the hiking trail had to offer, it was like l was a little kid turning a corner in a toy store discovering something new. The terrain for the most part was rocky, dry with some muddy sections & endless amounts of animals transporting goods. (Transporting with animals on this trail is a very ancient tradition; the trail is difficult to climb carrying heavy loads even though the Sherpa’s do an unbelievable job. It’s still a common practice using animals. Animals that are common at the lower altitudes used for transporting are Horses, Mules, Donkeys, Gaur & Banteng. Animals that are used at higher grounds normally around 5,000m plus are Yaks - they can deal with the higher altitude along with the coldness). After not getting knocked over by all the animals on the trail l finally made it to Monjo Camp feeling amazing & full of energy. Myself, Chris, Mark & Ed plus our guide set a good pace ahead of our group getting there super fast in just over 2 hours. I think we would of made it a little bit faster if it wasn’t for all the Donkeys. It was about 10am, l was ready for more hiking today, l felt so good but Randeep kept saying “climb high sleep low,” but he did say we will wait until the rest of the group gets here, eat lunch then climb about 100 metres so we can acclimatise a little more. After lunch it was time to climb a little higher, we went up as a group about 100 metres. l could slightly feel how the altitude was affecting my breathing, it was bearable so myself & Chris decided to go a little higher as we wanted to get to the top of this hill which was probably around another 100/150 metres. 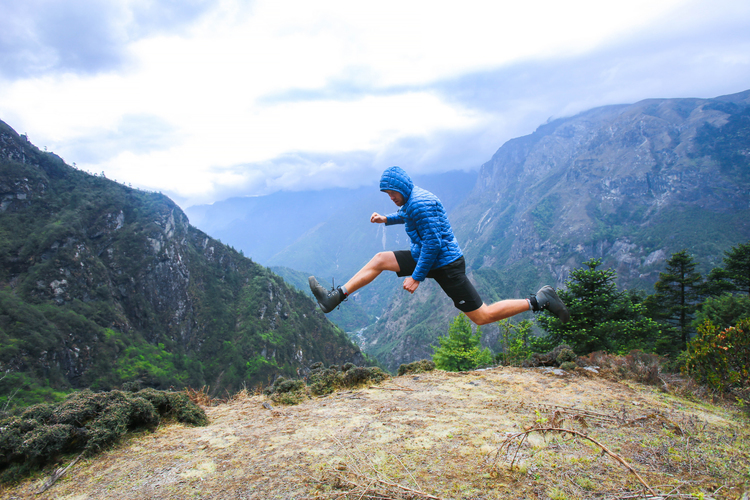 I have been wearing my The North Face exploration shorts everyday for the hike so far which have been unbelievable for me especially when l have been sweating lots, they dry extremely fast, they are comfortable plus they allow a lot of movement. Its great finding a pair of shorts that give me the freedom, because being an Ice Hockey player, we normally tend to find it difficult finding a pair of shorts that fit our legs & hockey bums after all the years of skating. (The North Face men’s exploration shorts - buy now at www.tiso.com & www.thenorthface.co.uk). GET 10% OFF ONLINE AT WWW.TISO.COM USING CODE - NORTH10. Sending good vibes & hope you all check out journal 2 when it's live!